With a bit of time off over the Christmas/New Year period I had a little plan up my sleeve. 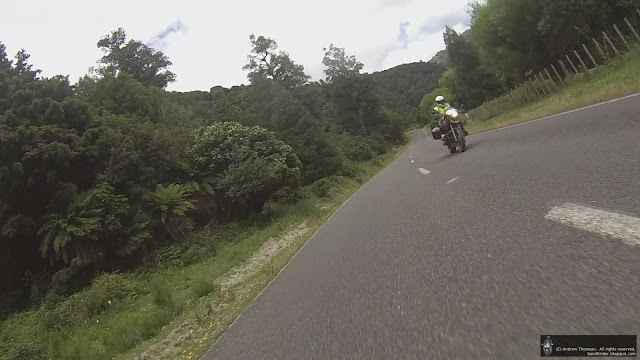 The plan involved a day spent in the saddle eating up a few miles by riding up to Wairoa, then taking in the Lake Waikaremoana Road before returning home. 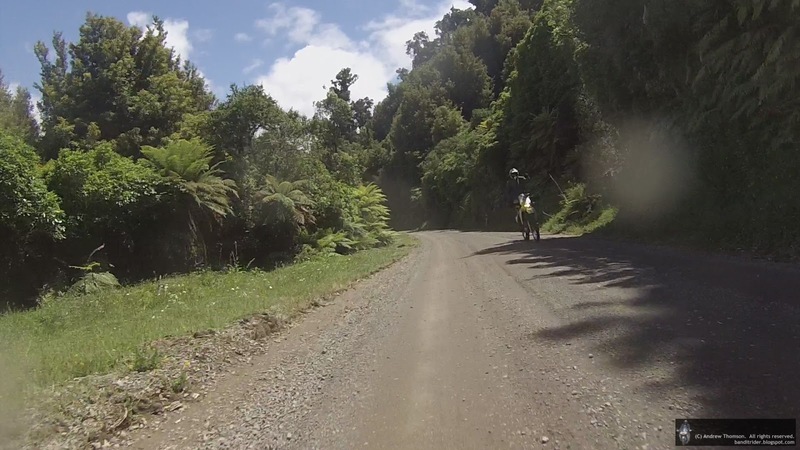 This is about an 800km day with Waikaremoana Road being about 160km long with probably around 100km of it being gravel. After doing the Christmas thing I was a little unwell for a few days but seem to have recovered enough as yesterday I finally got the ride in. And it was a near perfect day for it! I got up early (beating the alarm clock) and had everything I needed to get done, done by before 6:30 so was out the door just before then. In Dannevirke I stopped for fuel as my last fill had been in Taihape nearly two weeks previously. That important job done I loaded in cruise mode for the trip up SH2 & SH50 to Napier. 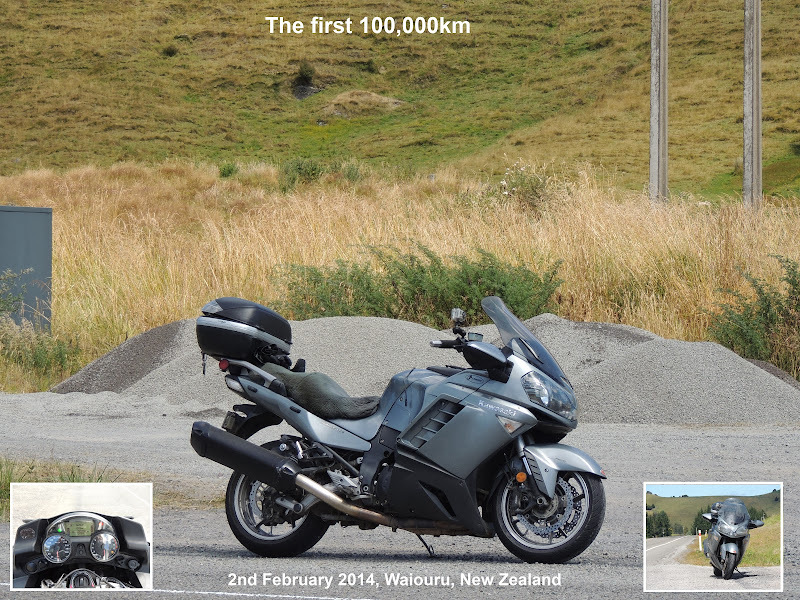 I hit Napier at about 8:30 and carried on out past Bay View and onto the Napier-Wairoa Road. Even with a few damp patches and the odd spit the Napier-Wairoa was fun and by 10:15 I was in Wairoa amazed at my 4.6L/100km average economy from Dannevirke. I stopped at the usual bakery to pick up some lunch to take with me and then headed off to top up the 2/3's full tank. 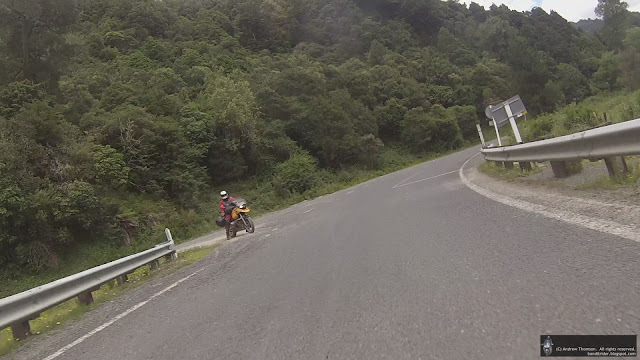 While I had ridden the Waikaremoana Road before I had not done the first of it from Wairoa - last time with the BRR group we had not even gone to Wairoa but turned off at Raupunga and taken more gravel roads over to it so this time around I was going to get to ride some new to me road. The road through to where we'd hit the Waikaremoana Road was mainly pretty good but windy seal with just a couple of short sections of gravel to give me a taste of what was to come. 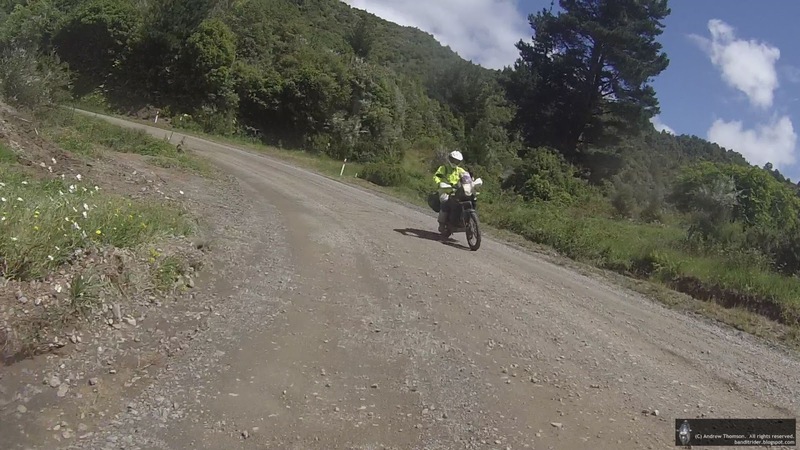 The little junction in the pics below show the road that the BRR came through on to meet up with the Waikaremoana Road. 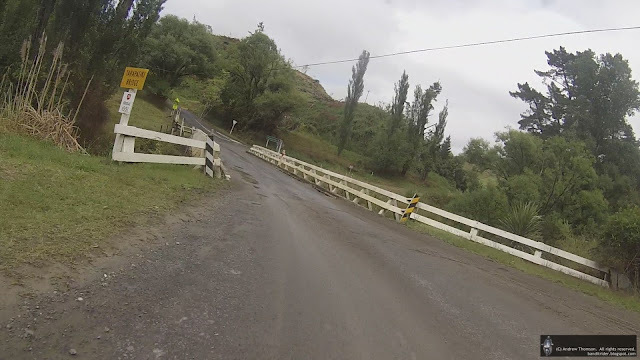 I'll leave the video until the end as it has quick snippets of the entire 160km but initially the gravel roads were quite wet with not a lot of actual gravel on them. They were very hard and occasionally corrugated but I found that there was still plenty of grip and really enjoyed the ride through to the lakefront. I stopped briefly there to tighten a loose mirror (I'd adjusted my bars the night before but not the mirrors and loosened the right one off when trying to adjust it on the fly) and a few quick snaps. Leaving the boat ramp I carried along on my way trying to keep an eye out for the lookout by the Mokau waterfall. Shortly after a wee slide on a wet wooden bridge I think I managed to find the right spot. More tightish, muddy roads led me further around the lake. The riding was great but so was the scenery and couldn't ride past all of it. Just past this point I saw the first of a few other bikers out enjoying some fantastic countryside. There was even a little Tenere in the group. By now I was probably around about the halfway point and the day was getting warmer and the roads a little dryer. There were a few cars about but at least most were keeping to their side of the road. At around 12pm I managed to find a picnic spot to have my lunch and listen to the birds. After my quick lunch there was more gravel to be disturbed and not long after re-passing a couple of cars I managed to capture a couple of GS's out exploring. Somewhere along here I nearly had my second run-in with a duck (and her babies) but I managed to avoid her even though she took flight and left her ducklings behind...I also managed to avoid a half a dozen or so horses grazing on the side of the road. The rest of the ride out was more of the same - good hard packed gravel with the odd short stretch of seal. Closer to Murupara the gravel finally ended but there was one heck of a neat bit of twisty tarmac to finish. Some of it is at the end of the video. After this fantastic 160km the rest of the ride (300+kms) was a bit of an anti-climax. There was a fair bit of traffic in places and I kept the speed down so that the fuzz wouldn't annoy me. In Waiouru (and after 375kms on the tank) I stopped for my last fuel stop and put in 20L - 3L to spare. More SH1 got me to Vinegar Hill where I could at last have a little bit of fun before getting home just after 4:30. It was one neat little ride and an ideal way to see out 2017! I was up early and after walking the dog and doing some chores had the Tenere on the road just before 8:30. I had all the vents of my jacket and pants open, tinted visor down and 3L of water on my back...I was ready for a hot ride. Riding out to Kimbolton the temperature was already 23 but it was quite nice with all the air coming through my vents. The road through to Pemberton was already showing signs of heat damage with the odd bit of slippery tar and loose metal to add to the fun. From Pemberton I turned off towards Ohingaiti as I thought this would get me close to the piece of gravel I wanted to do on my way up to Taihape. I also planned in a stop for a few pics. My route meant that a little bit of SH1 was in order but just short of Mangaweka I hung a left into Te Kapua Road. It turned out that this wasn't the road that I'd planned but it did turn into a nice little trip into the wop-wops. The road was pretty tight and windy and the gravel reasonably yicky in places. It also took me up and down a few neat little climbs and the scenery was very nice. Turning off Spooner's Hill Road there was a group of bikes parked up following their jaunt across the Napier-Taihape - it's very popular with riders now that all the gravel has been covered in tar. I was still in cruise mode but was loving the nice tarmac and great curves but had already decided that today was the day that I'd take the time to try and get some decent pictures. My first stop on the Napier-Taihape was at the old suspension bridge. One more climb and a quick stab across the tops got me to the turn-off to Mangaohane Road. It was here that I decided to have an early lunch before hitting the gravel once more. Getting nearer to Taoroa Junction the road got even better and even though it was a bit narrow in places I could still get along quite nicely. I also was getting used to making the odd stop. 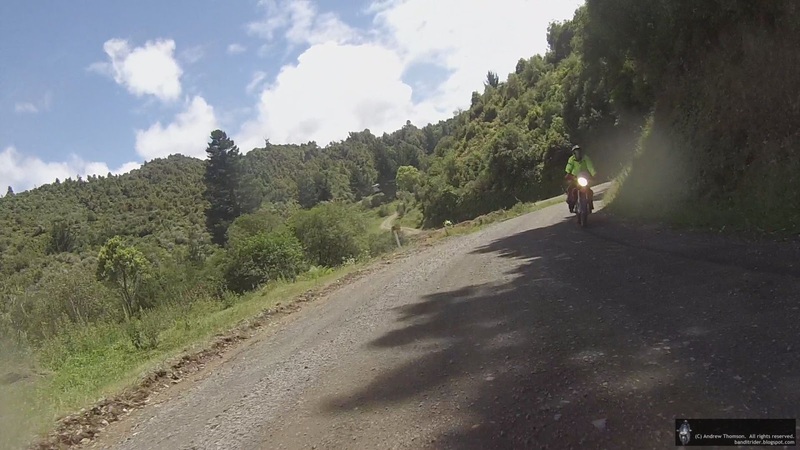 Eventually the gravel ran out and I hit SH1 again just North of Utiku. 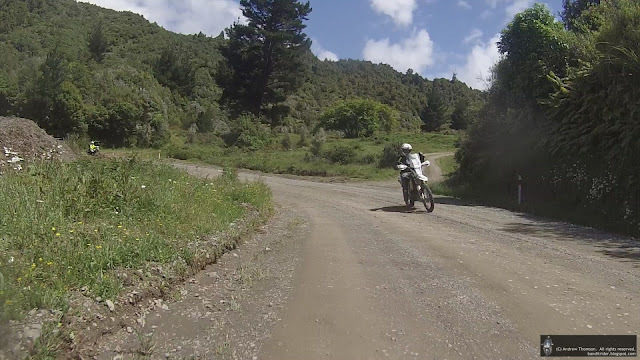 Luckily I was able to get off the main road again and find more corners and then more gravel. 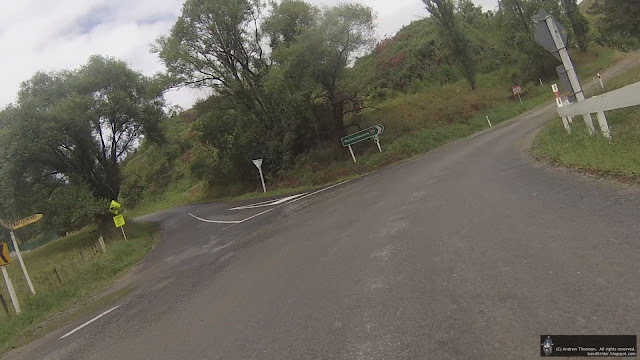 Auputa Road is a pretty windy little thing and I skated all over the road at times but then, after one last high-speed stretch of gravel, I was back out onto Rangawahia Road. 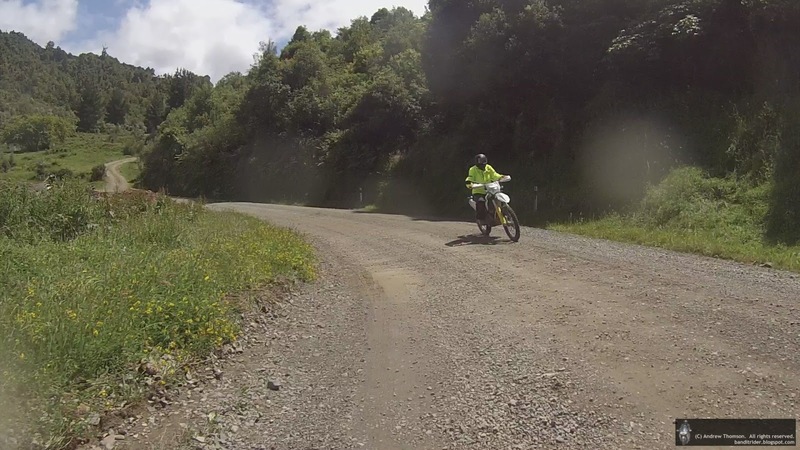 I planned a stop in Feilding but rather than the two easier black top routes from Cheltenham I turned off at Kiwitea for one last taste of gravel over Levett Line to Beaconsfield. A cold drink in Feilding and a quick catch-up with my folks before the pootle home to Palmy and that was the end of most enjoyable 350 odd kms in hot conditions (29 degrees by the time I finished).